In my grandmother’s house, no Yiddish was spoken, nor klezmer music heard. The first time I heard klezmer music was upon my arrival to Germany, where I was also asked, for the first time in my life, if I was Jewish. Raised in a secular home in a Jewish State, a daughter from a family that has been secular, on both sides, for generations, my first reaction was: No. It took me a few years until I understood that I am, as a matter of fact, Jewish. My grandmother from my mother’s side was born on November 16, 1929, in Thessaloniki, Greece, to a Romaniote family—an ancient Jewish community based in Ioannina, among other places in Greece. Many men in the family were known among the Jewish community and among the many powerful people in Greece. 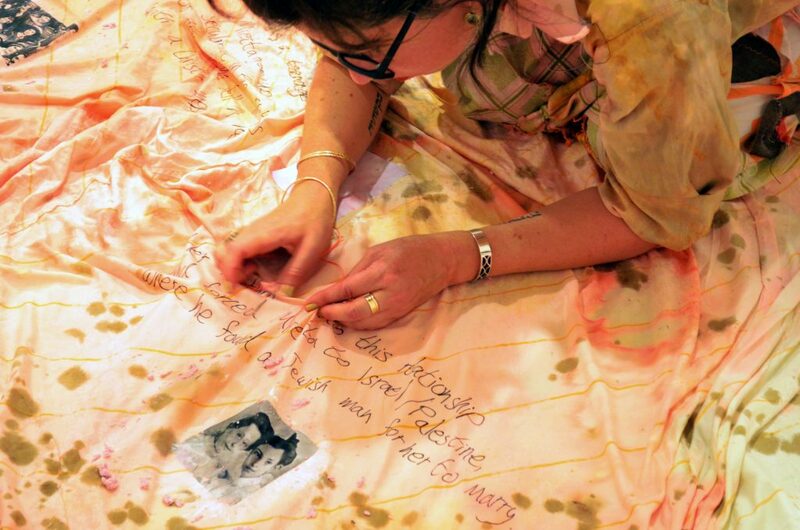 The women of the family were often home, passing on from one generation to the next the art of creating textiles. My great-grandmother, Hiette, collected old bedsheets, colored them, crocheted them together, and embroidered them; she passed this skill to her daughter, Miretta. I sit and speak with my mother. I ask her, because she is the only one left who can tell. She tells me I look a lot like her mother. I remember, as a child and as a teenager, I used to imagine that my grandmother was following me whenever I was alone or afraid. I don’t remember her. No visual image. All images I have in my mind are either from old photographs or from what I was told about her, mostly from my mother. When I think of her, I often look at myself and wonder if, when looking down on my body, I see what she saw looking down at hers. When wearing her clothes, I often try to imagine, where did she wear them to? Her clothes fit my body perfectly. My mother tells me about her childhood. About being disconnected from her own mother. About the forced separation between them. My mother tells me about the cost of feeling trapped and trying to escape; the heavy price of not raising and not seeing your children; the price of losing your motherhood. My grandmother was not only forced to leave her homeland, to travel to a foreign place, to learn a foreign language; she also lost any connection to her past and future. Perhaps this can explain the choices I made in my life? Traveling away to a foreign country, learning a foreign language, choosing a relationship with a non-Jewish man, having two children—a boy and a girl, just like my grandmother, not being able to let go of them for a long period of time, hanging on to them as if they would repair my past. For me, looking back, I can see how—through this relocation—her power in society completely changed. I can see how my grandmother perceived reality through the eyes of the colonizer. I can see—more than anything—how this perception erased not only the past of the indigenous community of the land to which she relocated but also her past: the past of the community from which she came, where they didn’t listen to klezmer music at home and didn’t come from the East or Central Europe, and where whiteness—if it was that at all—was soiled and dark. Her shadow is following me. Our bodies carry our personal and political histories, and our actions are—to a certain extent—guided by these scripts, sometimes to such an extent that we reproduce our ancestral past without any conscious awareness. This work explores the inscription of my family’s past in my body. 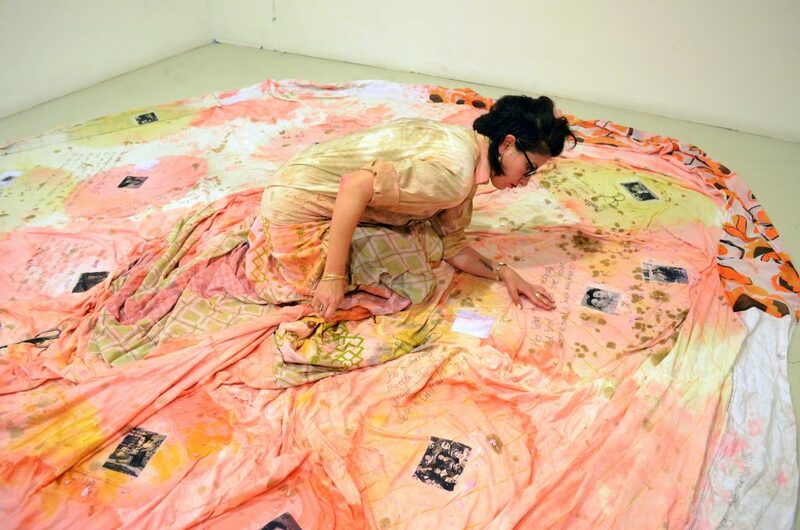 Collecting, archiving, and re-creating textiles, and performing the story of my grandmother, her mother, her grandmother, and her great-grandmother, I reconstruct a process of embodying the rich history of the Jewish women of Ioannina, Greece, while under the colonial and patriarchal gazes of German and Israeli nationalism. 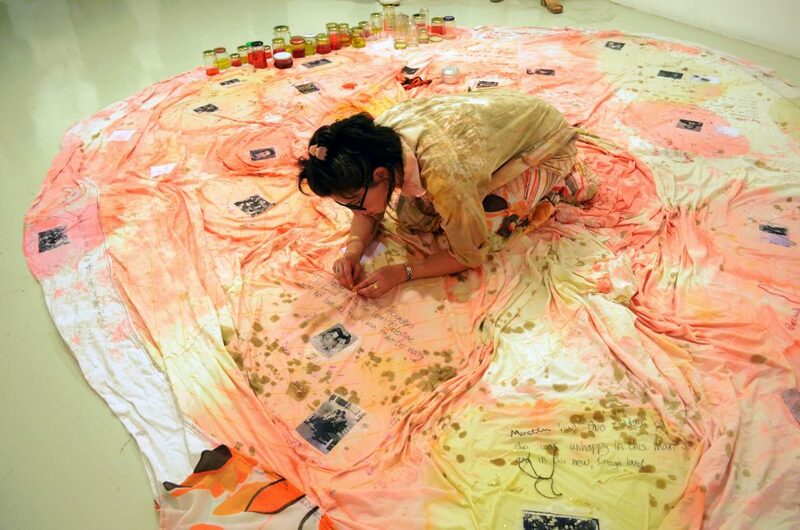 Adi Liraz is a Berlin-based interdisciplinary artist who uses mostly textile, text, and performance as her artistic language.